Upon completion, kids played on the new structure well into the night. Photo credit: Natalie Moran. Locally the Family Support Center of South Sound fosters a vision of “a community where all families are valued and nurtured and have the resources to be strong, healthy, and self-sufficient.” They offer parent education, family and homeless resource services, and supervised visitation support thanks to community donors, grants, and fundraising. 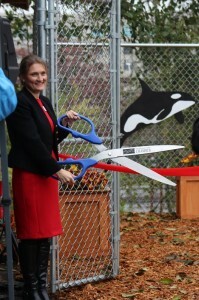 Family Support Center Executive Director Schelli Slaughter cuts the ribbon on Pear Blossom Place’s new playground. Photo credit: Natalie Moran. On November 7, Family Support Center welcomed the community to visit their brand new playground facility at their Pear Blossom Place Shelter at 837 7th Avenue SE in downtown Olympia. 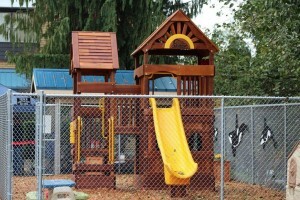 The playground was built with the generous support of the Leadership Thurston County (LTC) team, a program of the Thurston County Chamber of Commerce. 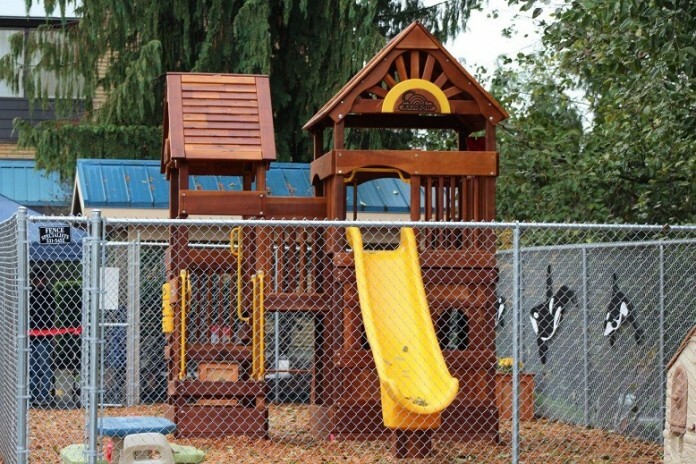 “Our Leadership Thurston County class, thanks in part to a significant donation from the Hawks Prairie Rotary, raised over $15,000 to provide a commercial-grade playground for Pear Blossom,” adds Ray. 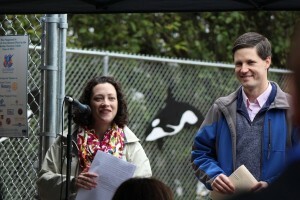 Leadership Thurston County members Stacey Ray and Bob Heck are two of the project’s instigators. Photo credit: Natalie Moran. “Each year hundreds of kids are going to have the opportunity to play here and every family will get to see what an amazing community we have here in Thurston County that cares about them,” continues Slaughter. The National Alliance to End Homelessness says that as of 2014, there were 578,424 people homeless on any given night and of these 216,197 are people in families. Let’s all do our part for those in Thurston County who need our help the most. Donations to the Family Support Center of South Sound can be made online or by calling their downtown offices at 360-754-9297. Families in need of emergency shelter can reach their hotline at 360-628-7343. They are located on the corner of State and Capital and offices are open from 9:00 a.m. until 5:00 p.m. Follow the Family Support Center on Facebook or sign up for their eNewsletter. Looking for a more hands-on way to help? They always have volunteer opportunities in every department.